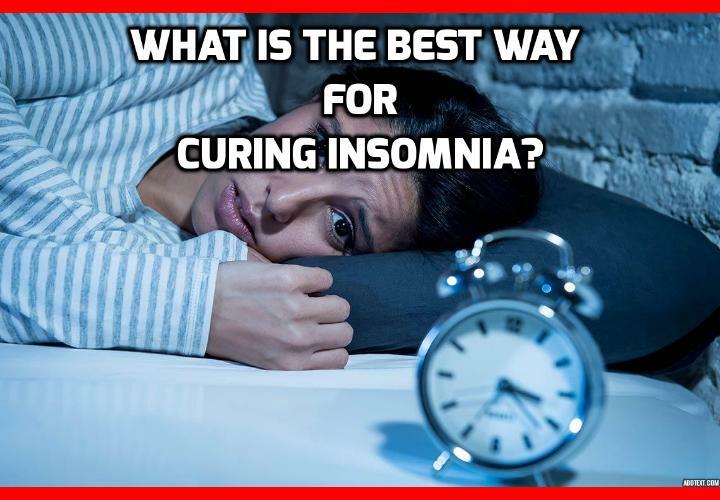 Curing Insomnia – Lyme disease Won’t Let Me Sleep! Some time ago, an avid reader wrote in reporting sleep issues. Unlike many people who suffer from insomnia, he knew when and very likely why the problem started. He had acquired Lyme disease. Sleep disturbances as well as chronic fatigue complaints are not uncommon in people who have this disease. This nasty disease is typically known to start with a rash which then leads to fevers, aches, and chills. Arthritis and other disorders can also occur as a result of acquiring Lyme disease. Deer ticks can carry the bacteria, and this is about the time of year we see an ‘up-tick’ in tick bites. Yes…pun intended. Such poor sleep (or lack of sleep altogether) at night then leads to the being excessively tired and sleepy during the day. A fair percentage of Lyme disease sufferers also complain of restless leg syndrome at night. Such fatigue, of course, can then create an environment for even more ancillary harm to the body. When we are worn out physically and mentally, we are primed for other illnesses and injuries. Such a serious disease requires consistent medical attention. However, there are many natural ways to significantly help alleviate many of the symptoms, including sleep disturbances. Creating a comfortable sleep routine and sleeping environment is especially important for anyone who suffers from sleep problems. Relaxation is a necessity in aiding sleep, so establishing a soothing nocturnal ritual can help with this aspect. Noise control makes sense to help ensure sleep continues uninterrupted. Abolishing the many brain stimulants such as the television shortly before bed time will also help. A better option would be to practice relaxation exercises combined with peaceful music. A number of people tout the benefits of certain natural herbs to help with both symptom control and even Lyme disease treatment. As always, I caution you to research this and consult with a trusted herbalist or other alternative treatment practitioner before attempting to cure the disease. As with all ailments, this is also an especially important time to ensure proper nutrition. It seems obvious, but often we crave the less nutritious “comfort foods” when we are in pain, are extra tired and are suffering. Those comfort foods, though, do not offer long term benefits; whereas a healthy diet will help create strength and energy which is needed to combat any health ailment. Given the many issues (many of them debilitating) that accompany Lyme disease, I offer complete sympathy to sufferers and appreciate the opportunity to share some information. I encourage you to check out my programs including the Insomnia Program and Arthritis Programs. Both are all natural, and have received great acclaim. Curing Insomnia – Pain in the Morning-Is it the Way I Sleep? Today I would like to take another question from the files of reader polls: What in the world can cause waves of pain upon waking? This comes up from time to time as people write in about the Stop Snoring and Insomnia programs. However, this question is a bit more generalized than what people usually ask me. To find out what is causing waking pain, we first need to find out when the waking pain is happening, and also where the pain is occurring. Pain that wakes you up at night or that you notice in the morning even if you sleep all night, and is generally limited to the legs is thought to be either a symptom of restless leg syndrome, fibromyalgia, arthritis, or circulation problems from another disease process. Pain limited to the ribcage and diaphragm area and causes problems with wakefulness at night can indicate issues in the muscles of the thorax or even a pleural (lung) disease process. Frequently, though, this type of pain (especially if there is chest discomfort) can indicate serious sleep apnea issues, which should be taken very seriously. What if it is low back pain in the mornings? This is usually because either your mattress needs to be replaced or you are showing the first signs of spinal subluxation. This can be a misalignment or even a chemical imbalance causing degeneration of the vertebrae. Now back pain that is limited to one side, however, can indicate a problem with how your kidneys are functioning, but simple blood tests can rule that in or out. The general tone of the rest of the reader’s email from when we started, though, talked about general waves of pain that wash over the whole body, as if it were being compressed. This was occurring regardless of whether he would wake during the night, which was frequently, or upon waking in the morning. This raises a whole different category of possibilities because of the generalized nature of the pain locations. – A disruption of normal sleep cycles. Dehydration is a tricky issue. Most people know by now (or should) that if you wait until you are thirsty to drink, you’ve waited too long. Another problem is the beverages chosen. We have discussed in the past that anything but water is generally not going to do a good job to give your body the proper amounts of hydration it needs. Balancing electrolytes is important, but generally people who have this problem are athletes or people with metabolic disorders. Anyone outside of these two categories should avoid sports drinks. We have also talked about sleep as it refers specifically to fibromyalgia, but even people who don’t suffer from fibromyalgia can be victim to this debilitating problem. The muscles in your body depend greatly upon your brain being able to sleep. Critical neurotransmitters released during stage 4 sleep are what help the nerves in the muscles to maintain good health. Other chemicals released during restful sleep help the muscle tissue itself to repair and grow. When we are limited on the amount of proper sleep, we are limited on the chemicals we need to recover from the daily damage we cause to ourselves just by living life. A friend of mine mentioned that she frequently woke during the night with the same types of crushing pain. It only lasted a second or two but it washed over her literally from head to toe. She had spoken with her doctor to rule out the scary diseases and underwent a lot of testing. She discovered that she was dehydrated and she set to work at changing her water intake. I gave her some information on what people need as a minimum intake (at least 2.5 liters per day). She improved a bit but it wound up being the sleep study that saved her. It turns out that she has mild sleep apnea and just a mild case of snoring. But, her anxiety issues were causing her to wake up no less than 20 to 30 times during the night. Once she got that straightened out, her sleep naturally improved and the combination of proper hydration and better rest solved the pain problems. Naturally solving the sleep issue is usually a better resolution than resorting to pills, and is almost always much cheaper than prescription drugs as well. If your sleep is disrupted because of snoring or anxiety that leads to insomnia, I recommend you check into my programs for naturally resolving these problems today. I can really relate to readers who have trouble sleeping due to severe pain. I couldn’t count all the sleepless nights I had when my neck was out (after literally being hit by a truck). Of course, I assumed that my neck pain was keeping me up. This is exactly what many people suffering from Arthritis, neck, back, TMJ or other pain complain about. You understand how it’s not possible to sleep when your joints are squeaking. But there is a twist to this. It’s something I didn’t realize until my neck began to get better. You see, as I began doing the exercises I teach in my neck pain program, I began to feel a lot better on a daily basis. Most of the time, I didn’t even notice pain in my neck at all. But then came nights that I didn’t sleep very well. Sometimes I was flying overnight, other times it was anxiety or excitement that kept me up. No matter what the reason for my sleeplessness was, the next day my neck always hurt like … you know, not heaven. I’ve heard the same comments from many readers suffering from any type of pain. If you don’t sleep well, all other health issues get worse. So why is that? What does good sleep have to do with pain relief? During the day, we’re so busy taking care of everything out there in the world that our bodies can’t restore themselves. Sure, we take a few pit stops here and there but that’s just so we can make it through the day. It’s when we sleep that the natural doctors and nurses of our bodies get to work. They are able to breathe with the relief that our conscious mind is gone away and our much smarter subconscious has taken over. As we dream about the green, green, grass of home, our growth hormones and white blood cells spread around the body, restoring harmed joints and sore muscles. The tricky part is that it takes 90 minutes of sleep to get the maximum amount of healing hormone and cell production going. After that, more moderate amounts are produced and delivered throughout the night. So if you don’t get a constant 2-3 hours of good, deep, uninterrupted sleep, your body never manages to bring itself up to its maximum production power. And anything that’s not essential suffers. So if you’re suffering from pain, regardless of what it is, I’m sure you’ve checked out our neck pain program or our new arthritis program. They are both very helpful and thousands of people have benefited from them. But also, make sure you get a good night’s sleep every night. Our natural insomnia program has been very helpful for curing insomnia. Although easy fixes like relaxing before going to sleep and not staying up too long may be all you need. Previous PostPrevious What is the Best Way for Relieving Insomnia? Next PostNext What is the Best Way to Eliminate Snoring and Sleep Apnea?